I’m sorry. I’ve been pathetic at updating my blog. Last September was the last time I had time to update it and even I cannot believe that. Between school, power outages, holidays, blizzard, sicknesses etc.…. I have not had time, but the additional truth is, I’ve thought about it… but could not find inspiration in my circumstances. Today, however, I had an inspiration - ha! Lucky you! Yes, I need to have inspiration – something share-worthy, and today that would be…. [insert drum roll…] a seven year old frozen turkey breast I found in the bottom of my freezer! YES! Aren’t you excited?! I was!! Seriously, I was – hence the reason it takes me so long to blog. Strange things inspire me. Okay, so our chest freezer needs to be de-frosted – plus, I wanted to get to the bottom of it and use up all those forgotten frozen things like turkey breasts from when we first got the freezer in 2006. It’s actually been pretty fun and sort of like a trip down memory lane with the things I’ve dug out. Hamburger and hot dog buns from a Labor Day picnic from like 2006. A package of scallops wrapped in bacon from BJs from a New Year’s party we threw in 2007… various containers of left-over sauces and soups I’ve made over the years… shredded zucchini from the garden from about 4 years ago. Going to make some zucchini bread with it this weekend – in the middle of winter – as intended, albeit many more years later than intended. Well, back to the turkey breast. It was a 5.5 lbs. I threw it in the oven and roasted it today. I wasn’t exactly sure what I wanted to do with it, but when it was done cooking, I looked at it and asked it what would make it happy. It said, "soupie". Yes it did. So that’s what I made. I shredded up the meat and put 2.5 large containers of broth in my big, black vat. Then, I took the pan that had all kinds of good, yummy goobers from roasting the turkey and put it on the stove-top. To it, I added a couple sticks of butter, three large chopped Vidalia onions and 1 lb. sliced mushrooms. I let that sauté and get all yum in the pan. Meanwhile, I took 3, 6 oz. bags of fresh spinach and dumped that in the vat. 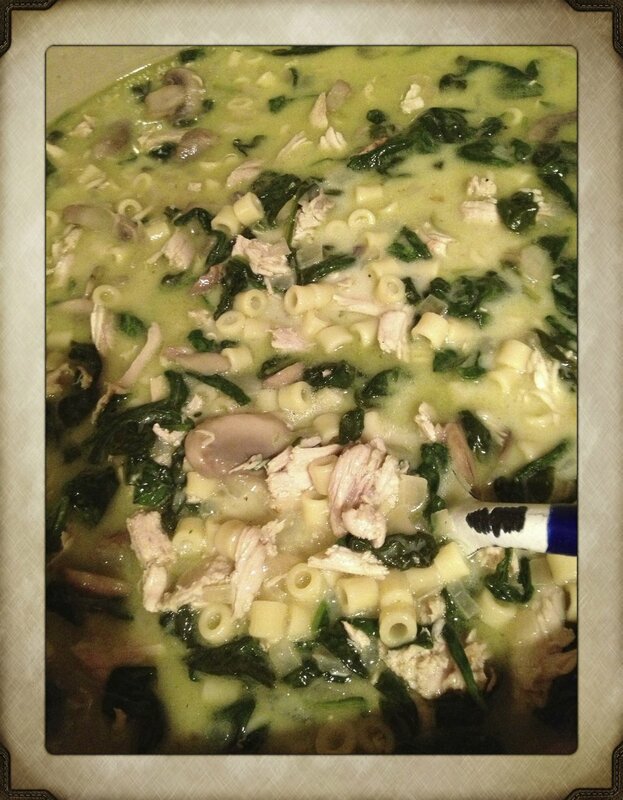 When the onions and mushrooms were done, I dumped that on top of the spinach in my vat. The heat from that began to cook the spinach. Next, I cooked up a pound of ditalini macaroni and then dumped that on top of the onions and mushrooms in the vat. I stirred all the yumminess together and texted the daughter to pick up some more broth on her way home because the goober to broth ratio was not quite right. I hauled the vat onto the stove top to heat ever so slowly until the extra broth could be added… and seasoned with salt and pepper. I tasted it and had an idea… what if I added a bit of half-n-half? Best soup you ever had in your life. As I was furiously concocting this amazingly fun soup, and the smells were filling the kitchen, I realized it was all-of-a-sudden way too quiet. I looked down to these faces staring at me and realized it was their dinner time. What a tease – they’re hungry and patiently waiting as I finish my mad-scientist work. So, I wish I could say, something like ‘until next week’ – or even ‘until next month’, I’ve now realized I have to stick with something very non-committal like, ‘until the next inspiration hits…” I bid you happy inspirations! P.S. Oh, and speaking of things that inspire me? 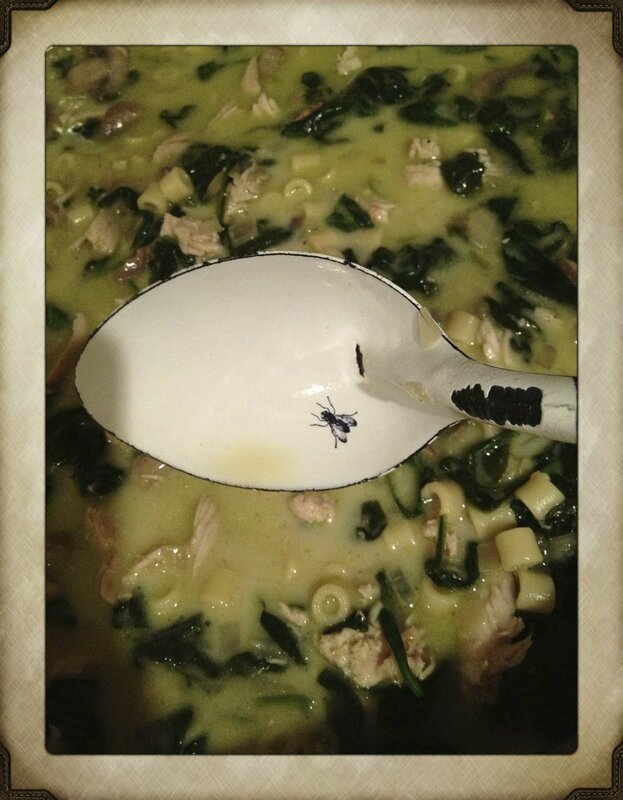 My favorite soup-stirring spoon... it's enamel and has an inviting guest designed onto it. Can you spot it in this picture?